Almost a year ago, I started this blog, and my husband and I departed for a business trip to Maui. One of the highlights of that trip (as far as dining is concerned) was Happy Hour at the Sands of Kahana restaurant. We loved their Mai Tais and shrimp quesadillas. When we returned from Maui, I was on a mission to make my own Mai Tais and came up with a real winner of a recipe. Being pregnant, I'm not able to drink those right now, and that made me a little sad when reminiscing about Maui. 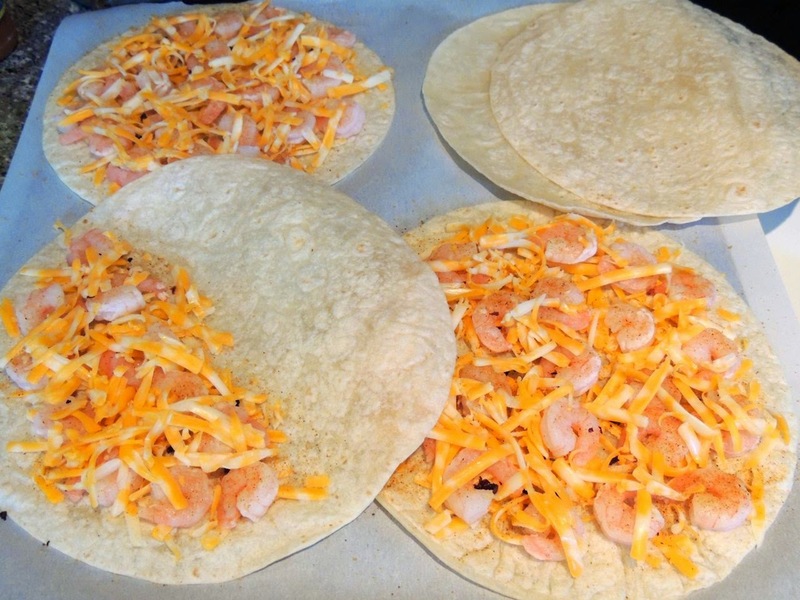 Then I thought about the shrimp quesadillas. I can't believe I didn't try to replicate those a long time ago! I can eat those while I'm pregnant, maybe while drinking some orange juice or pineapple juice (or, when not pregnant, one of my Ono Mai Tais), and feel like I'm in Maui. 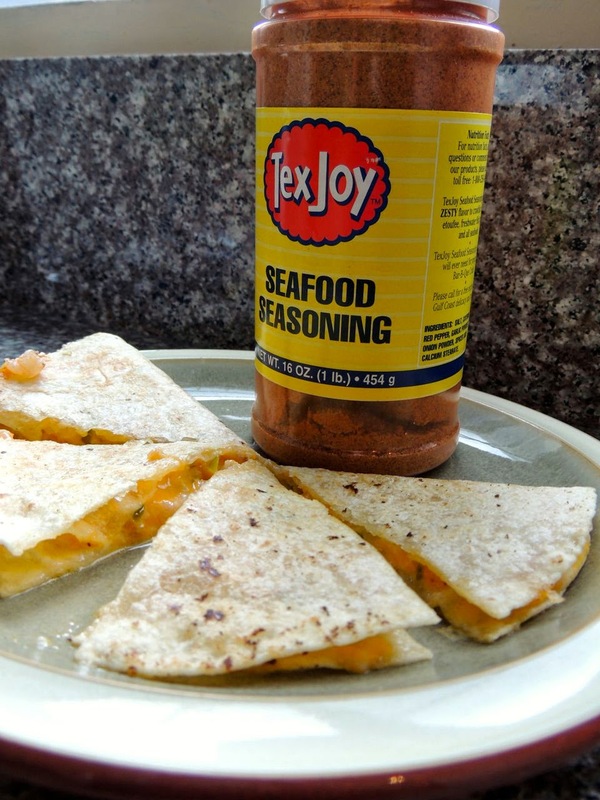 With a little experimentation, I came up with a simple and delicious recipe for shrimp quesadillas. 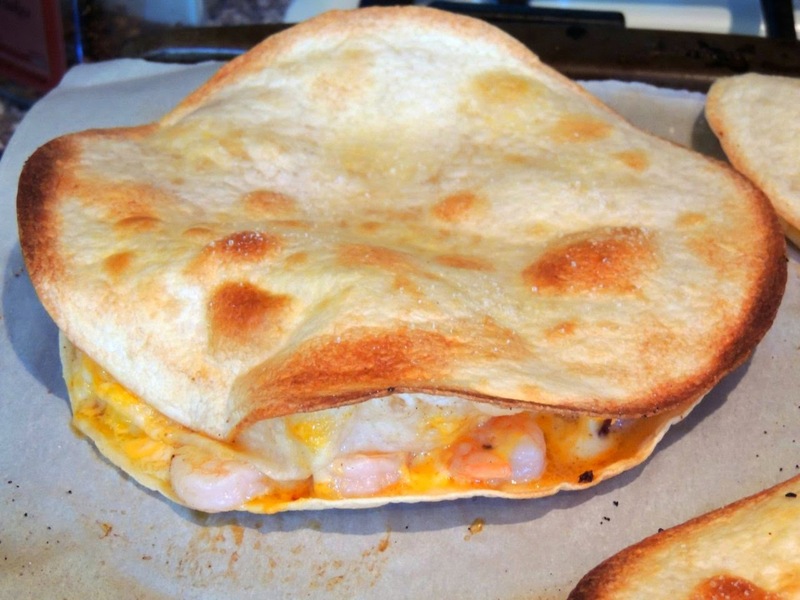 Cheese and shrimp are so amazing together. You just can't go wrong! 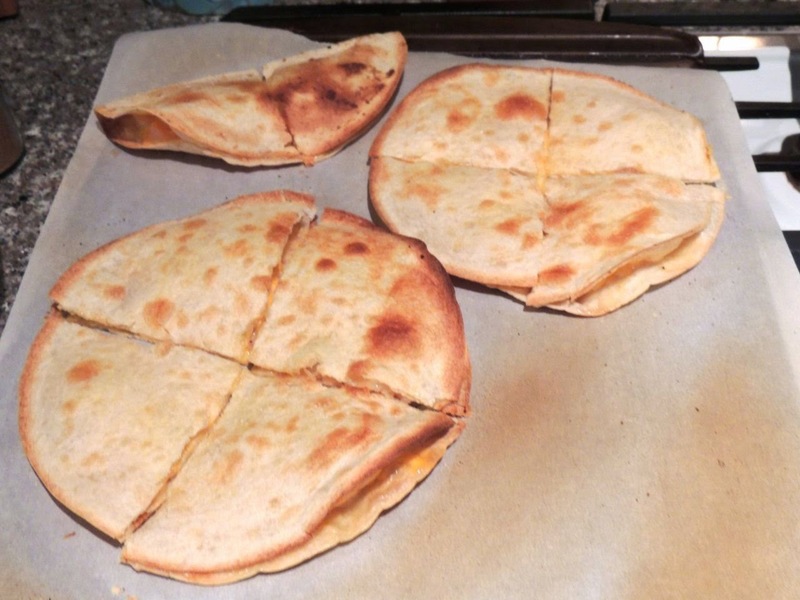 The recipe that follows is for one quesadilla, but as you can see from the pictures, I usually make more than one at a time, and it's just as quick and easy. It's even easy to make a half serving by folding a tortilla in half instead of using 2 tortillas. Heat up your broiler to about 400. Put parchment paper on a cookie sheet. Put one tortilla on the cookie sheet. Top with half the cheese. Then add the shrimp. Sprinkle the Seafood Seasoning over the shrimp. Top with the rest of the cheese. Place the other tortilla on top. Spray the tortilla with spray butter and sprinkle with salt. Place the cookie sheet under the broiler for about 5 minutes or until the top tortilla is golden brown. 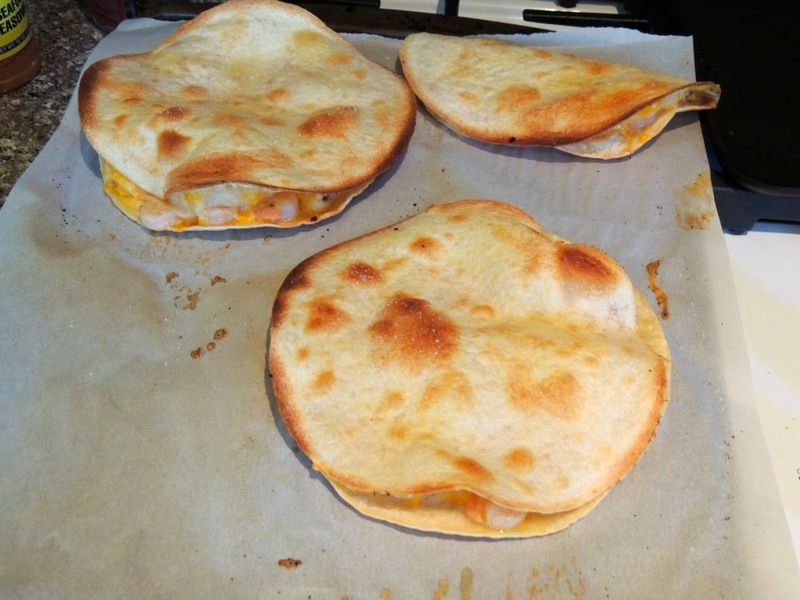 Take the cookie sheet out of the broiler and flip the quesadilla over. Spray the top tortilla with spray butter and sprinkle with salt. Return to the cookie sheet to the broiler for another 1-2 minutes or until the top tortilla is golden brown. The tortillas may also get puffy, which I love. 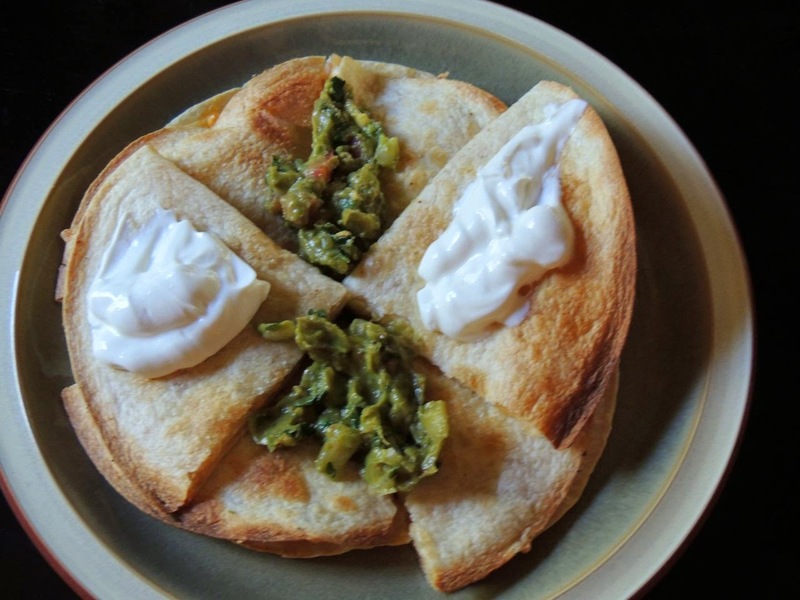 Place the quesadilla on a plate and cut into four to eight pieces, depending on how big you want your pieces to be. Top with sour cream and/or guacamole.